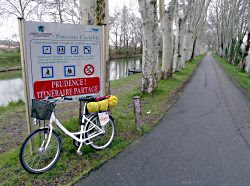 I was in France last week, cycling the Canal du Midi (picture). 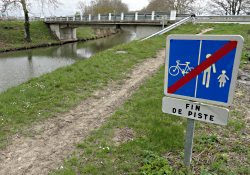 The 240km long engineering marvel, linking Toulouse with Beziers via Carcassonne (and hence, with other watercourses, the Atlantic and the Med) offers a flat, traffic-free cyclable route through the south of France. What's not to like? Well, er, quite a lot, actually. The 40km east out of Toulouse is superbly surfaced, and skatable-smooth. But the scenery is as dull as yesterday's croissants, and you don't go through any towns or villages. It's plain boring. 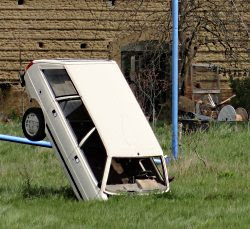 About the only noteworthy sight is this car sculpture in a farmyard near Gardouch (picture), which may be a comment on French driving. Once the tarmac finishes, you're into the canalside lottery familiar to English towpath riders: a mishmash of smooth gravel, bumpy gravel and muddy, lavishly-puddled paths (picture). Fine on a mountain bike, but what's the point of a mountain bike without mountains? I did it on a shopping bike, because at least there were some shops. And the front basket was big enough for a baguette, bottle of red and slab of pate. 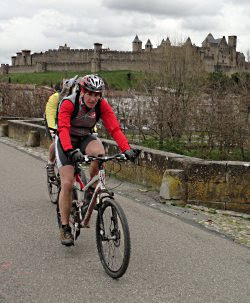 Carcassonne, with its magnificent medieval walled town, is a highlight. You can cycle to it across the traffic-free old bridge (picture). Its old town is magnificent, though some aspects, such as the towers' pointy roofs and the cycle parking by the entrance, are evidently inauthentic. The Canal du Midi is, in sum, a bit dull; for me, exploring France by backroads is much more interesting. 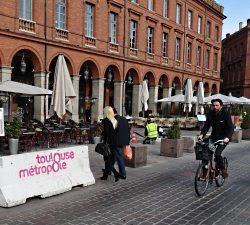 But Toulouse itself is of interest to the real cyclist. 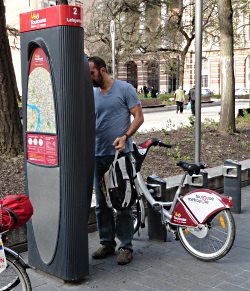 It has a bike hire scheme (picture) along the same lines as that in London or Paris. You wouldn't call it a Cycling City - it's not Cambridge, but then, where is? 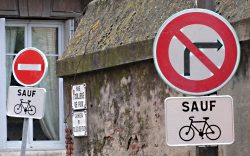 Oxford, perhaps - though Toulouse has a steady trickle of everyday cyclists (picture). The flatness helps, but so does the permeability. In the centre, it seems every street, even if one-way for cars, is two-way for cyclists. Often these lanes are startlingly narrow, but I had no problem with the salmon-thing, cycling against oncoming traffic (picture). Indeed, French drivers seemed on this trip very good at overtaking me with plenty of space on rural roads, and driving safely and steadily on cramped city streets such as this (picture). I wish English cities were as flexible with bike contraflows. Perhaps that farmyard sculpture in Gardouch isn't a comment on French driving after all. Having lived in France for the last 2 years, first in Montpellier and now in Rennes, I can attest to the universal superiority of French drivers when it comes to courtesy and safety. 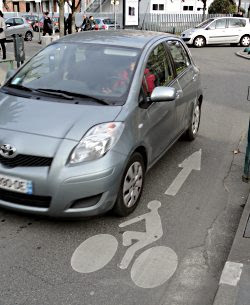 I was shocked, when arriving in Montpellier, that drivers approaching cycle-crossings would stop and wave cyclists across. It's the same in Brittany.